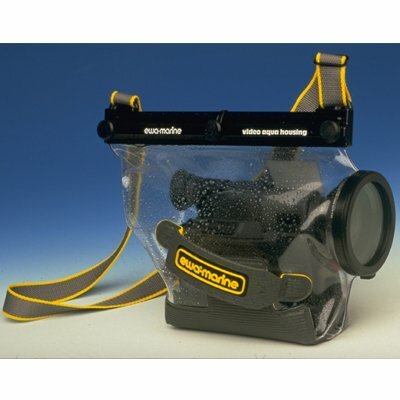 The VDS is a generic 10 meter / 30 ft depth housing for camcorders with or without an eye-piece viewfinder. Designed specifically for the camcorders listed below, the model VDS housing is manufactured from a special laminated PVC and has an integrated, optically neutral flat glass port. Even the touch screen will work with the camera in the housing. The touch screen monitor can be operated from outside while the camera is fitted inside the underwater housing. It has a wrist strap with a handy quick release clip to ensure it is always ready to use in and under water. But also to ensure that it is always safely connected to the operator and camera man. A pair of non-corrosive and seawater resistant clamping rails which fit together for perfect sealing. They tighten by means of knurled thumb screw knobs. Designed specifically for small, "consumer" style, modern digital camcorders, with or without view finder, the ewa-marine VDS underwater housing is manufactured from our special, double laminated PVC and has an integrated, optically neutral flat glass as a front port. With this housing you will receive a set of adapters that fit the filter threads of the most popular lenses on the market today. By means of this adapter the camera is then docked into the housings front port, ensuring that the lens remains parallel and centered behind the front of the lens. Just as if it were a clear, neutral optical filter.